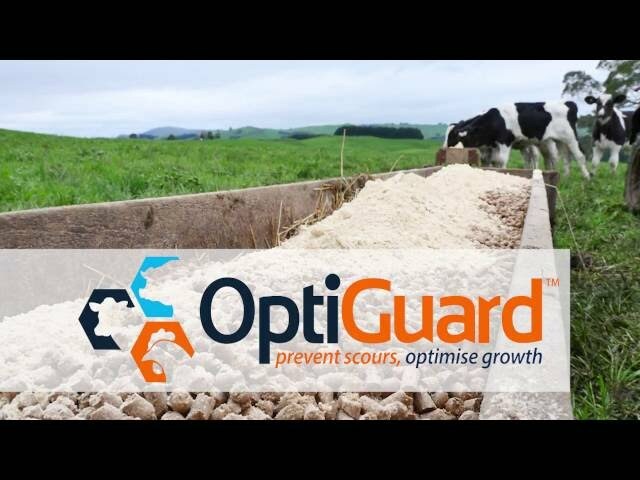 OptiGuard premium calf anti-scour is a finely milled zeolite product that is available through your local vet clinic. OptiGuard is a very finely milled, geologically young, natural mineral specific to the Taupo volcanic zone in NZ called BPM zeolite. BPM Zeolite is an alumino silicate with a porous three-dimensional honeycomb framework with a net negative charge. The combined honeycomb framework and net negative charge, allows BPM Zeolite to both absorb liquids and adsorb compounds. When fed to calves this provides many advantages to their developing immune systems. OptiGuard significantly reduces scours, while enhancing a calf’s resistance to disease and aiding their digestion processes. This allows calves to grow to weight more quickly and wean earlier. Scouring in calves is the highest contributor to dehydration and so removing the possibility of dehydration enables the calf to utilise the nutrients it is being fed and optimise its growth. OptiGuard is completely natural and BioGro certified as an input for organics, it is cost effective, it has so many benefits in terms of animal health, and is also beneficial to the environment. OptiGuard is available in 20kg bags. Ask for OptiGuard today. "I just wanted to say how much I love this product. For example I had stopped feeding as all our calves were over 1 month old and passed the high risk scouring stage. But one of vats of stored milk went off and all the inside calves got the shits. Normally this could have turned out very badly but I just bulk fed them OptiGuard and they were recovered within two days. Simply add Optiguard to your calf-meal mix, or place it directly into feed troughs to allow calves to self-manage their intake. Optiguard can also be mixed with milk. Simply stir to reconstitute. Addition rates from 10gm per calf, per day – or ad-lib as necessary. Optiguard is available in 20kg bags and 1000kg bulk bags.